Chronic Obstructive Pulmonary Disease (COPD) is the third leading cause of death in the U.S., which is why I wrote a book with the Men’s Health Network (MHN) called Breathe Easy: Your Lungs and COPD. 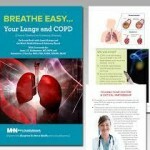 And in an effort to help the 12 million Americans who have COPD and the 12 million more whose symptoms remain undiagnosed, MHN partnered with the Association of Black Cardiologists, the Veterans Health Council, and Men’s Health Alliance to develop the new, and extremely valuable resource. Click here to download a f.ree copy of this book.